A small vase of flowers gifted from an Oxford local sits on a table in the only Mosque in town. 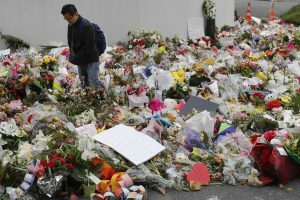 According to Muslim Student Association adviser Naeemul Hassan, many community members have sent flowers and otherwise reached out during the past week. The effects of the New Zealand shooting that killed 50 people and wounded nearly 50 others worshiping at two mosques in Christchurch, New Zealand, has impacted the Oxford community from 8,157 miles away. The Mississippi Muslim Association and the Muslim Student Association at Ole Miss have released statements regarding the attacks in New Zealand. The Mississippi Muslim Association released its plan of action for a situation in which it becomes aware of an imminent threat to the Muslim community here in Mississippi. They remind people to be on alert and to look out for suspicious behavior. “Report anything, and I mean anything, to law enforcement,” Mississippi Muslim Association’s statement reads. In MSA’s statement, the organization calls for the the community to come together. The Muslim community in Oxford works to foster relationships with people in the city. Its members welcome guests on Fridays, work with the religion department on campus and host events. Elhawy said people with hatred in their hearts can create damage with anything. However, he believes that positive communication is a step in the right direction. “We should make our talks more peaceful and productive than destructive,” Elhawy said. Rev. Eddie Willis, campus minister of the Ole Miss Wesley Foundation, acknowledged that while the massacre was nearly 10,000 miles away, the presence of hatred is boundless. The university released a statement condemning the acts of violence and reminding students there are services available to them if they feel unsafe or have concerns. The massacre in New Zealand was the first mass shooting in the country since 1997. “Whatever people say affects others and affects their decisions and behaviors, so we really need to be concerned about these things,” Elhawy said.